What a year Loathe are having. The Liverpudlian metallers have come out of nowhere and a lot of buzz has been generated about them after the release of their utterly fantastic debut The Cold Sun. Several high-profile magazine appearances later, and fans have finally been able to catch Loathe on tour across the United Kingdom. Being a part of the band’s first ever headline tour was a privilege that you should not pass up if you get the chance; with tour dates that see the band head to London, Manchester and Sheffield (just to name a few), you may yet get to see the band before the year’s end. On a quiet night in Bristol, in a small venue that is coupled as a coffee shop, record store and bar all in one, little did people know that something big was going down. 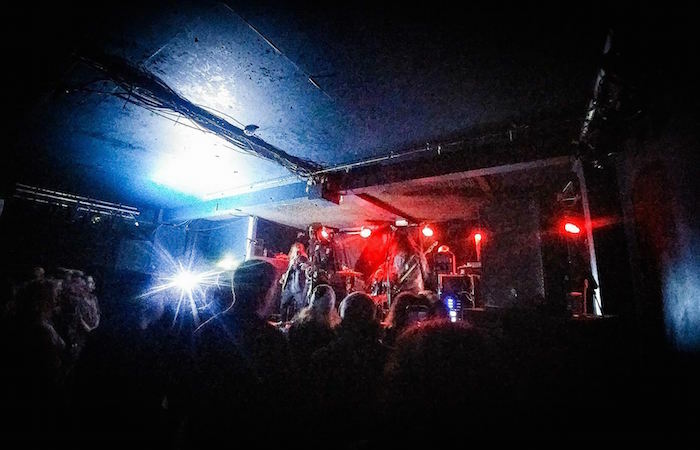 Across four powerfully heavy bands, a small gathering of like-minded folks in the West Country were treated to a night of destructive force and crunching riffs. 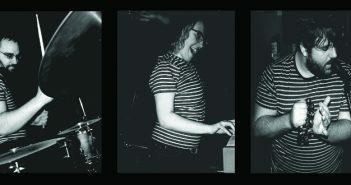 Loathe were the jewels in the night’s crown, but none of the outfits did themselves a disservice. With little more than 20 in the crowd, Ursus took to the stage. Unperturbed by the turnout, the band decided to knock people back by their tremendously heavy sound. The djent-infused deathcore sound was accomplished, but unspectacular stuff despite the brutality of the vocals and riffs. It was nice to see the crowd get involved, although some geeing up from the frontman was required to get everyone closer to the stage – an odd feature that stayed throughout the night. Based on their performance, Ursus will find fans thanks to their assured playing and energy. The second of the smaller scale support acts played to a slightly larger crowd, with fifty or so enjoying their Architects-esque style metalcore. Akin to Ursus, Dead Sea delivered an assured performance and their short set should see them pick up a couple of new fans. Musically, however, it was the least interesting part of the night, with an overall weaker sound to them compared to what was before and what was to come. Decent, but not spectacular. 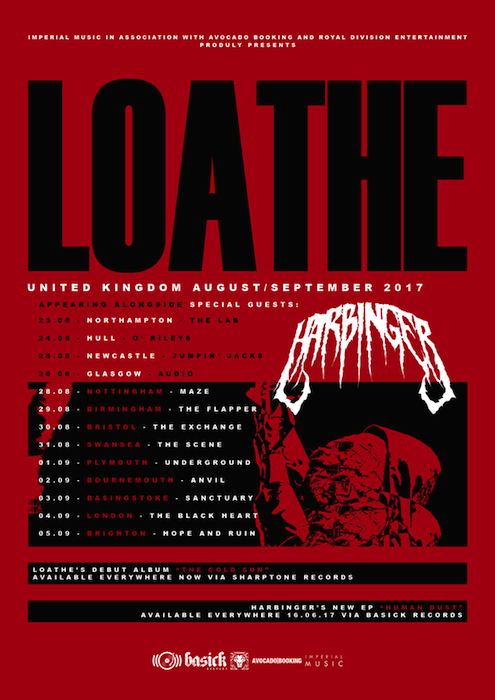 Joining Loathe as the main support act across the tour is Harbinger. This death metal group were a class act in their slightly extended stage time. Harbinger brought a lot of energy onto the tiny stage they found themselves on. Spearheaded by a particularly lively performance from the bassist, they got the crowd going excellently. Small pits opened up, heads were banging, not bad for a crowd of little over fifty. Harbinger will walk away from this tour with a good amount of new fans. Indeed, it probably will not be long before we see this lively death metal outfit heading off on their very own headline tour. Harbinger are an exciting band, one to keep an eye out for. Harbinger may be an exciting new prospect in the death metal scene, but Loathe are one of the most promising, exciting new metal bands in years. Imagine if Meshuggah were a metalcore band and you’ll get the idea of Loathe’s style. The Cold Sun is a record full of energy, dark grooves and plenty of experimentation that is simply not found in countless other metal albums. Loathe is brutal, atmospheric stuff. This is a smart album that means a lot to the band and this meaning is never more pertinent than in their live shows. Donning a blank mask, Kadeem France runs through the middle of the crowd, urging everyone toward the front. We all oblige. ‘It’s Yours’ begins to play, even in this small crowd of just over fifty people, there’s a palpable excitement in the air. Loathe’s sound is refreshing, exciting and bold. It seems people appreciate this. Fans sing along, bang their heads and start up little circle pits, much to the pleasure of Kadeem France. Loathe’s performance is full of energy and for such a small space, contains a surprising amount of planned movements and there are even a couple of screens set up with perfectly timed images that coincide with the live performance. Indeed, Loathe’s live performances have a lot going for them. At one stage, Kadeem jumps off the stage and enters the crowd – this goes down a treat and sees a large circle pit emerge. With all this going on, you would be forgiven thinking that the band’s unique sound takes a hit – it does not. It all sounds as crisp, powerful and exciting as it does on the record. Loathe are the masters of their game, and it seems like they are set for a big future based on not only their superb debut album, but also their spectacular live performances. Loathe are the real deal. Photo credit for banner: Isaac Watson.